Giant sperm 17 million years old discovered in Riversleigh site, near Queensland, Australia. Giant sperm belonged to group organisms ostracoda, similar crustaceans, sometimes called a seed shrimp. Together sperm cells, also found Zenker organs, organ made of chitin, serves to transfer sperm to the female, who preserved. Ostracoda sperm length 1.3 mm, slightly larger than the size ostracoda itself and 23 times greater than a human sperm (about 0.055 mm). "This is the oldest fossil ever found sperm," said Mike Archer, a researcher School of Biology, Earth and Environment, University of New South Wales, which has been excavated Riversleigh for 35 years. 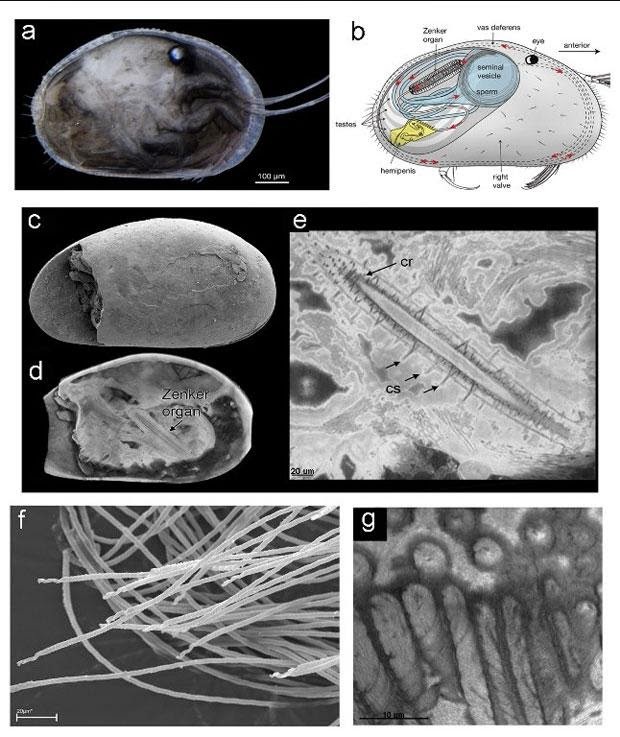 Story of the discovery of the oldest fossil sperm began when Archer and colleagues, Suzanne Hand and Henk Godthelp, collecting specimens of ostracoda Bitesantennary sites at Riversleigh in 1988. Samples were then sent to John Neil, a specialist ostracoda of La Trobe University. Neil works closely with other specialists, Renate Matzke-Karasz of the Ludwig Maximilian University, Munich, and Paul Tafforeau of the European Synchrotron Radiation Facility in France. Microscopic analysis of the specimens showed that the organs in the creature is still in good condition. In the internal organs, scientists found a giant sperm cell and its nucleus containing the genetic material. "About 17 million years ago, the site is a cave in the middle Bisantennary rain forest rich in biodiversity. Ostracoda who live in small puddles in the cave that is constantly enriched by the droppings of thousands of bats," Archer said as quoted by Physorg on Wednesday, May 14, 2014. Suzzane Hand, a bat expert extinct, said, bat droppings may also play an important role in preserving the giant sperm. Bat excrement make the water rich in phosphorus, triggering mineralization of soft tissues in ostracoda.